) of Human FOXO1A (NP_002006.2). ab131339 is purified by affinity-chromatography using an epitode-specific phosphopetide. 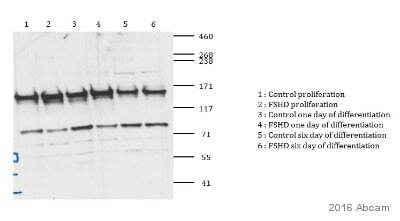 Non-phoso specific antibodies are removed by chromatography using a non-phosphopeptide. Our Abpromise guarantee covers the use of ab131339 in the following tested applications. WB 1/500 - 1/1000. Detects a band of approximately 78-82 kDa (predicted molecular weight: 69 kDa). Incubate membrane with diluted antibody in 5% non fatmilk, 1X TBS, 0.1% Tween 20 at 4 C, with gentle shaking, overnight. Immunofluorescent analysis of formalin-fixed, paraffin-embedded human breast tissue with Anti-FOXO1A at 1/100 dilution. A Goat Anti-Rabbit IgG H&L (CY3) at 1/50 was used as secondary. Immunofluorescence analysis of methanol-fixed MCF7 cells using ab131339 at a 1/100 dilution. Immunohistochemical analysis of paraffin-embedded Human breast carcinoma tissue using ab131339 at a 1/50 dilution, in the absence (left) and presence (right) of the blocking peptide. 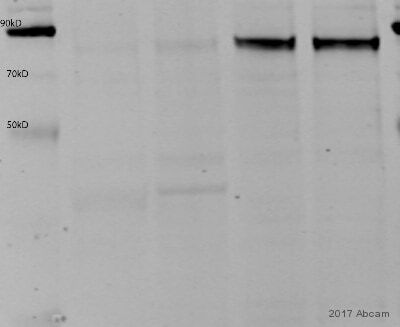 I tried both of these antibodies with my bovine sample and am seeing a lot of background bands. Is is possible that these will not work in my sample? 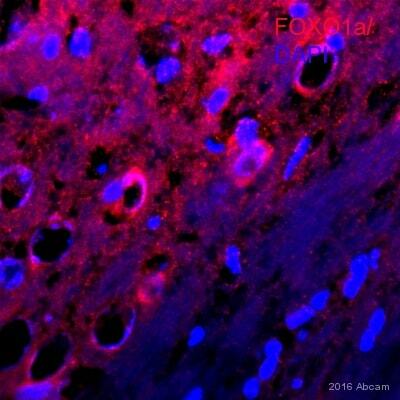 Thank you for contacting Abcam regarding the FOXO1A antibodies ab39656 and ab131339. I have examined the homology between the immunogen sequences and the bovine sequence, and they are actually identical. In theory then, these antibodies should be able to recognize the bovine protein. Since we have not tested this the antibodies are not guaranteed to work with this species. Further optimization may be required. 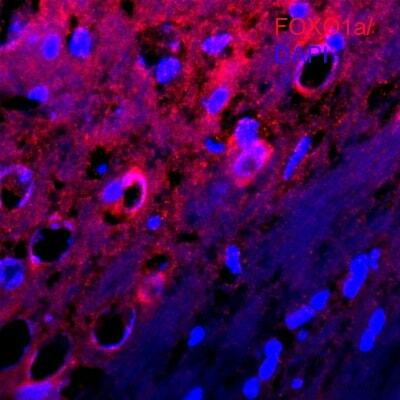 ab38501 - Anti-FOXO1A (phospho S256) antibody. The immunogen is a bit longer and may confer greater specificity, resulting in less background. Since ab38501 has not been tested in bovine in WB, I can offer a discount off a future purchase if you buy ab38501 now, test it inbovine and submit feedback to us in the form of an Abreview. It doesn’t matter whether the Abreview is positive or negative, we would just really like to receive your feedback. The discount would be to the value of: 1 free primary antibody. 1. Reply to this e-mail to let me know that you would like to proceed and test ab38501 in bovine in WB. I will then send a discount code. This code must be issued before purchasing ab38501 so please wait for my reply before ordering. 2. Purchase ab38501 either by phone, fax, or online (www.abcam.com). 3. Test it in bovine in WB. We are always pleased to obtain feedback about our products and any information is greatly appreciated! Even if ab38501 turns out to be unsuitable for bovine in WB, you will still receive the discount on your next purchase after your Abreview has been submitted.